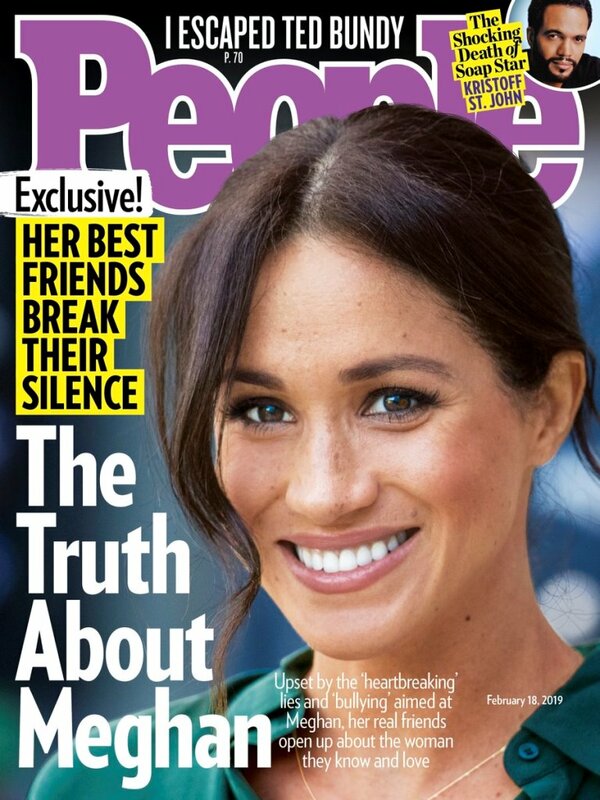 That’s the headline on the cover of the new issue of PEOPLE Magazine featuring Meghan Markle. And it’s a direct rebuttal to the way the British tabloids have been reporting on her. As you know, the last few months have been a sh-tshow, with the UK papers going ham on the Cambridge-Sussex situation following Prince Charles’s birthday, publishing story after story about whether or not Meghan’s mean to Kate, suggesting that Meghan is “difficult” because she gets up early and sends emails – and it’s been this way since the very beginning, since news first broke that Meghan was dating Prince Harry, with that undercurrent of racism and classism that the British have perfected. Back in December, royal reporters were accused of racial bias, of deliberately portraying Meghan as a royal disruptor, tearing apart the royal brotherhood, and ignoring the machinations of the royal court, which have much more to do with the tension that exists between the palaces. Now PEOPLE is delivering the defence of Meghan with their latest exclusive – and it’s a really good read. I just flipped through the pages of the print version and there’s information here that we’ve not had before. PEOPLE spoke to “five women from Meghan’s inner circle – a longtime friend, a former costar, a friend from LA, a onetime colleague and a close confidante”, all of whom are “speaking for the first time” anonymously. According to the costar, “Meg has silently sat back and endured the lies and untruths. We worry about what this is doing to her and the baby.” That’s the setup for the motivation. The costar goes on to explain that, “Now we want to stand up against the global bullying we are seeing and speak the truth about who our friend, a mother-to-be, really is”. One of the big truths the five women are addressing is about the Markle family, some of which we already knew. Like the fact that she was never close to Samantha and Thomas Markle Jr, her father’s children from a previous marriage. They were older, Meghan did not grow up with them, and Samantha only started using the last name “Markle” when Harry and Meghan went public. The Saturday before the wedding, she and Harry were told that a story was going to come out the next day saying that Tom was staging pictures with the paparazzi. (Lainey: which he ended up admitting.) Their team told them that if the story was fake, they could file a complaint. So Meg calls Tom and asks him, and he’s swearing up and down that it’s not true. The next day the pictures come out. Even with all that, Meghan and Harry were still so focused on getting him to London. At no point was there talk of “Now that we know he lied, he’s in trouble”. Tom wouldn’t take her calls, wouldn’t take Harry’s calls. The next morning when the car got there [to take him to the airport], he wouldn’t get in. [Later] Meg heard he had a heart attack and she’s calling and texting, even up to the night before the wedding. It was like, “Please pick up. I love you and I’m scared”. It was endless. After the wedding she wrote him a letter. She wrote him a letter. Well Thomas Markle certainly never mentioned that – not in his interviews with Piers Morgan on Good Morning Britain or the Daily Mail for the Sun. All he ever says is that she’s ghosted him. But there was a letter. She’s like, “Dad, I’m so heartbroken. I love you. I have one father. Please stop victimizing me through the media so we can repair our relationship”. Because every time her team has to come to her and fact-check something [he has said], it’s an arrow to the heart. He writes her a really long letter in return, and he closes it by requesting a photo op with her. And she feels like, “That’s the opposite of what I’m saying. I’m telling you I don’t want to communicate through the media, and you’re asking me to communicate through the media. Did you hear anything I said?” It’s almost like they’re ships passing. He knows how to get in touch with her. Her telephone number hasn’t changed. He’s never called; he’s never texted. Remember, Thomas Markle’s sob story has been that he keeps trying to contact her and she won’t answer. So who’s lying here? Meghan and her friends or the dude who already lied about staging pap photos and who’s always getting his close-up on TV? Most rational people out there probably already saw the grossness in Thomas Markle’s behaviour. This, though, is the first deliberate refutation of his claims. The upside is that Meghan’s circle is getting to address the f-cksh-t that’s been happening recently. The downside? Thomas Markle is going to dial up his friends at the Daily Mail and the Sun and Piers Morgan and they’re not going to ask him the tough questions and challenge him – it doesn’t serve their purpose. So, probably by the weekend, we’ll be hearing from him again. And then a fresh wave of mess will be upon us. As for the rest of the PEOPLE article, well, not surprisingly, Meghan’s friends take on the other rumours, about her alleged celebrity attitude and all that other fiction we’ve heard, one by one. They talk about visiting her at Nottingham Cottage, how low key she is, how she still cooks dinner almost every night, how they don’t have a chef or any other kind of staff. That she paints her own nails. That she does her own makeup. That she picks her own clothes. That she is as caring as she ever was about the people who are close to her. The goal is to build her up as an angel, almost a saint, and, you’ll note, in an American publication. Which, I appreciate the intention, especially since she’s been attacked so relentlessly, but swinging dramatically in the other direction will provoke a reaction. The PEOPLE story was given exclusive airtime on Good Morning America today and the British press will probably not react well to it. They’re already pissy about not getting enough access. Finding out that Meghan’s friends have spoken exclusively to shut down their reporting in America will only make them thirstier for blood. And it’s not like they’re above getting dirty.